Your donations provide a moment of peace for needy children like these. They live in places where amenities are few and priviledges we enjoy are non-exisitent. Contribute today and provide a moment of peace. If only for a moment. Our outreaches and missions partner with local doctors to bring good healthcare to people in Africa. Healthcare in Africa is not only limited but in many areas, it is almost non-existent. Friendx of Africa is committed to changing that. Liberia is a country of 3.5 million people yet the ratio of doctor to patients is 1 to 28,000! Medical facilities are also struggling as much of Liberia’s infrastructure was destroyed during the 14 years of civil war. The general population cannot afford to go see the doctor or get medication unless someone from outside the country sends money or medicine. Even then, the battle to feed a family or visit the doctor is one that must be decided on a daily basis. It is against this backdrop that Friendx of Africa is traveling, from November 8, 2018, to November 20, 2018, along with a team of doctors, nurses and lay persons, to conduct a one-week Medical Mission health fair. FOA will be hosted by Pastor Simeon L. Dunbar, Founder and Senior Pastor of the Liberty Christian Center, Johnsonville, Liberia, West Africa. Liberty Christian Center boasts 8 acres and a large auditorium that seats 8,000. The team will also have opportunity to visit orphanages and prisons and conduct outreach and mental health sessions with the men, women and children in Johnsonville and the surrounding areas. Donated surplus supplies to local clinics. FOA will send two medical teams to two countries in 2018. In October, the first team will leave for Ethiopia and in November the second team will leave for Liberia. Both teams will partner with local establishments and local health professional to conduct one week each of health campaigns to screen patients and provide first aid for various health conditions. FOA is still in the process of recruiting health professionals and raising funds to purchase medical supplies for these outreaches. 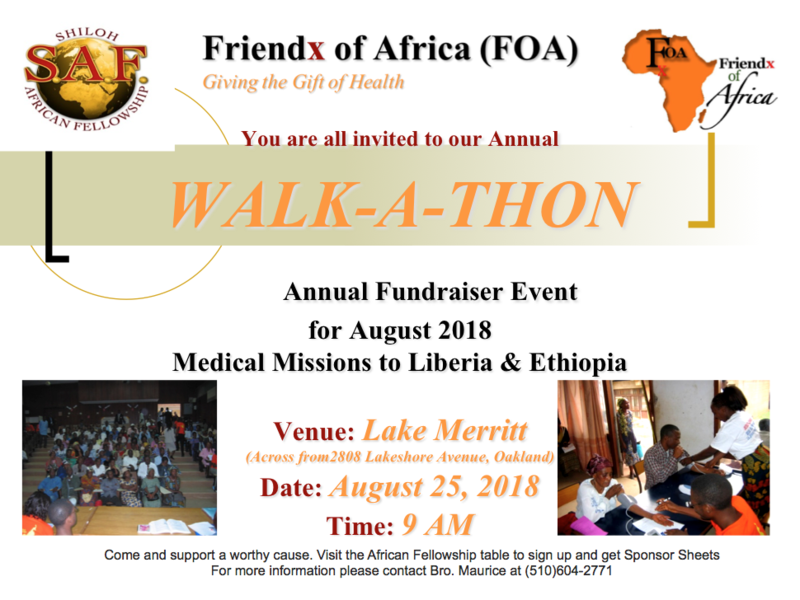 There will be a Walk-A-Thon fundraiser on August 25th at Lake Merritt in Oakland, California. All are welcome to join in the fun activities in support of a worthy cause. Watch this brief video and learn who we are, what we do and what we stand for. Make An Impact! - Donate.